First let me offer apologies for not keeping up with the blog as well as I should. A combination of a stressful semester teaching and a general pessimism about the state of my academic career left me with, simultaneously, too much to do and too little motivation to work on the blog. Again, many apologies to my dwindling number of faithful readers. Your support and interest in my assorted ramblings matter a great deal to me. Because he’s fancy, that’s why! I’ve had this chart and the button charms for almost twenty years now (yikes! 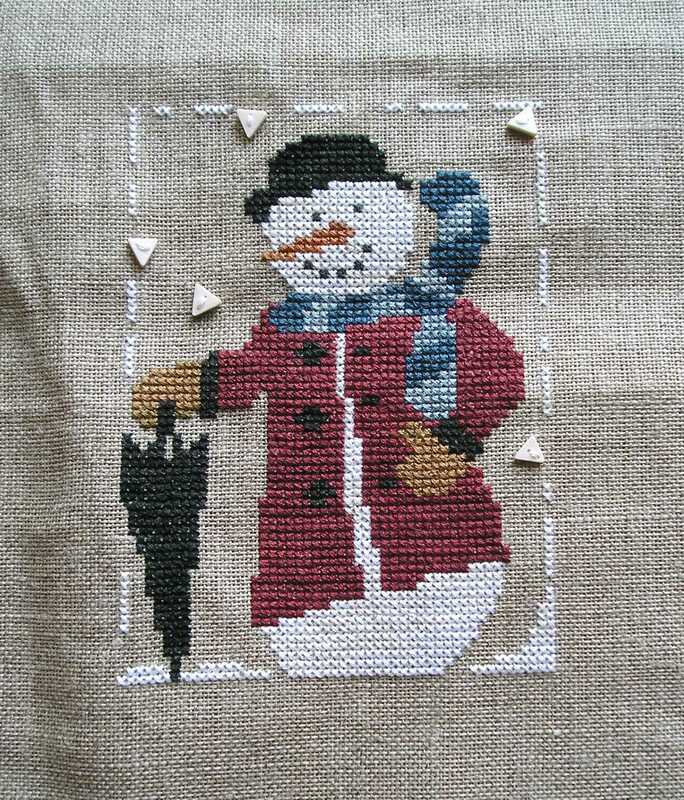 ), along with the chart and charms for the companion piece, “Cromwell the Snowman.” I plan on stitching his buddy Cromwell later this year as part of the Smalls SAL. I switched the color of his jacket (Weeks Dye Works “Lancaster Red”) with the color of his mittens (Gentle Art “Tarnished Gold”); you can see the called-for color combination here. For some reason I can’t explain, I just preferred a red jacket to the mustard color. The other threads called for are WDW “Deep Sea,” “Onyx,” and “Whitewash,” and Gentle Art “Nutmeg” and “Old Blue Paint.” Any bets on how long it will take me to finish-finish this? I stitched this ornament as a Valentine’s Day gift for my two nieces, Ella and Lauren (hence the initials on the back), and finished it in typical pillow-style, which is practically the only style I know. This is the first time I added beads along the seam and I lucked out finding the matching white ribbon in my stash. It came out pretty well, if I do say so myself, and the girls liked it, which is what counts the most. I hope to be back on track soon with the blog, which should be a lot easier now that the semester is over. I hope you will all stay with me — I have some exciting new plans for the future! Happy stitching to all! Giveaway: If you would like the pattern for “Antique Hearts” with some of the leftover hand-dyed floss, leave a message below and I will send it to you along with another complementary pattern from Charland Designs. Next Post Breast Cancer Ribbin’ Scarf Pattern Free! !